Department of Pharmaceutics 1, SVKM’s Dr. Bhanuben Nanavati College of Pharmacy, Mithibai Campus, Vile Parle (W), Mumbai - 400456, Maharashtra, India. Quality Assurance Executive 2, Teva Pharma India, Pvt. Ltd, Mumbai - 400076, Maharashtra, India. ABSTRACT: Schizophrenia is a severe and disabling disorder which needs immediate administration of a suitable drug. Olanzapine, a BCS class II atypical antipsychotics drug of thienobenzodiazepine class is frequently prescribed to treat schizophrenia. The aim of the present investigation was to formulate mouth dissolving films of Olanzapine to improve its solubility and patient compliance. An inclusion complex of Olanzapine with 2-hydroxypropyl-β-cyclodextrin at a molar ratio of 1:1 enhanced solubility of the drug. A patient compliant MDF using Pullalan as a film-forming polymer was developed using the design of the experiment, 32 factorial design. The independent variables selected for optimization of MDF containing inclusion complex of 2-hydroxypropyl-β-cyclodextrin and Olanzapine were polymer concentration (3-5%) and plasticizer concentration (25-35%). The optimized film demonstrated optimum tensile strength of 3.91(gm/cm2), the disintegration time of 15.45 seconds and fast dissolution of 99.3% in 6 minutes. All the films formulated using solvent casting method were smooth and elegant in appearance. Rapid release of Olanzapine from MDFs indicated its suitability as an oral delivery system in the management of panic attacks of depressive schizophrenia. INTRODUCTION: Difficulty in swallowing or chewing of solid oral dosage forms particularly in the pediatrics, geriatrics and dysphasic class of patients limits the wide applications of oral drug delivery systems. Unwillingness and fear of choking towards the administration of solid dosage forms in such patients have set the researchers towards the design of innovative oral drug delivery systems 1, 2. The patient’s quality of life has been significantly improved through the design and development of new mouth dissolving drug delivery systems and is recently gaining an essential position in the market by overcoming administration problems. Drugs administered through oral cavity enhance bioavailability due to rapid absorption, elimination of the first-pass metabolism and pre-gastric absorption from saliva containing dispersed drugs that directly enter the stomach. Mouth dissolving dosage forms combine the advantages of both solid and liquid oral dosage formulations 3-4. Mouth dissolving films (MDFs) have recently gained interest as an alternative to fast dissolving tablets (FDTs) due to increased patient compliance. MDFs are thin, elegant films of various sizes and shapes, un-obstructive with fast disintegration and dissolution within few seconds with rapid drug release in the oral cavity without the need for water. A major limitation in the development of oral MDFs is taste masking of the bitter drugs, leading to poor patient compliance. Cyclodextrins have been reported for their ability to mask the bitter taste of the drugs along with incorporation of flavors and sweeteners - (natural sweeteners) glucose, fructose, dextrose, sucrose, isomaltose and (artificial sweeteners) aspartame, sucralose, acesulfame-K, neotame 5-8. MDFs comprises of an active agent, water-soluble hydrocolloids such as pullulan, pectin, hydroxypropyl methyl cellulose, carboxymethyl cellulose, plasticizers, flavoring agents and preservatives. Olanzapine is an atypical antipsychotic drug of thienobenzodiazepine class used for the treatment of schizophrenia and bipolar disorders. This BCS Class II drug with a half-life of 21-54 h undergoes extensive first-pass metabolism and results in highly variable oral bioavailability. Schizophrenic patients hide a conventional tablet under their tongue to avoid the daily dose of an atypical antipsychotic while schizophrenic patients with dysphagia are not able to swallow the traditional Olanzapine tablet. Considering the problems of these patients an attempt has been made to design rapid MDFs of Olanzapine 9. Thus the present study aimed to design, develop and evaluate MDFs of Olanzapine, an antipsychotic drug used in the treatment of schizophrenia and bipolar disorder. Materials: Olanzapine was a gift sample from Amali Drugs, Vapi, Gujarat, India, 2-hydroxypropyl-β-cyclodextrin (HPβCD) was a gift sample from Amoli Organics Pvt. Ltd., Vapi, Gujarat, India. Pullulan was obtained as a gift sample from Hayashibara Company limited; Japan PEG400 was purchased from CDH Chemicals, Mumbai. Anhydrous citric acid was purchased from S.D. Fine Chemicals, Mumbai, India. Aspartame was purchased from All India drug supplier, Mumbai, India. Drug Excipients Compatibility Studies: Compatibility studies were performed by mixing the blends of drug and excipients at various ratios and subjecting the mixtures to 25 ºC / 60% RH and 30 °C / 65% RH for two months. The drug-excipients mixtures were observed for any physical change in color or any interactions by Differential Scanning Calorimetry (DSC) and Fourier Transform Infrared Spectroscopy (FTIR) studies. Preparation of Olanzapine-HPβCD Inclusion Complex by Kneading Method: Accurate quantities of Olanzapine and HPβCD were weighed in 1:1 molar ratio. A homogenous paste of Olanzapine and HPβCD was prepared in a mortar with small quantities of ethanol to maintain suitable consistency of the paste. The paste was kneaded for 1h followed by drying in a hot air oven at 40 °C for 3h. The dried complex was powdered and passed through BSA 60 mesh sieve and stored in airtight containers until further use 11, 12. Drug Content: Olanzapine- HPβCD complex equivalent to 10 mg of drug was accurately weighed and transferred in a 100mL volumetric flask. To this, 100 mL of ethanol was added to dissolve the complex. The solution was stirred for 60 min and filtered through a 0.2 µm ashless Whatman filter paper. 1 ml of the solution was withdrawn and transferred to a 10 mL volumetric flask and volume was made up with phosphate buffer pH 6.8 to obtain a concentration of 10μg/mL. Drug content was estimated at λmax 226nm by UV spectrophotometer 13. Saturation Solubility: The saturation solubility study was performed according to a method reported by Higuchi and Connors. Briefly, an excess quantity of inclusion complex was added to 40 mL distilled water in 6 amber color glass bottles. The bottles were sealed and vortex mixed intermittently followed by orbital shaking with equilibration at room temperature for 24 h.
Aliquots of 2 mL were withdrawn at 1h intervals and filtered through a Whatman filter paper. 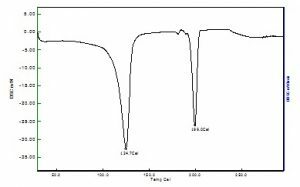 The concentration of Olanzapine in the filtrate was analyzed by UV visible spectrophotometer at λmax 226 nm. Each study was performed in triplicate. 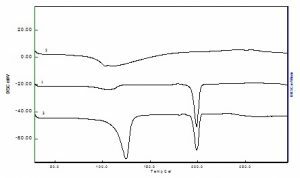 FTIR Studies: Infrared spectrum of Olanzapine, HPβCD and inclusion complex was performed using the potassium bromide dispersion method. Before the study KBr (IR grade) was dried for 2 h at 130 ºC. Samples were powdered and triturated with KBr in ratio 1:100 for uniform dispersion of the drug. The mixture was then pressed into a disc using a special mold and hydraulic press using 100psi. 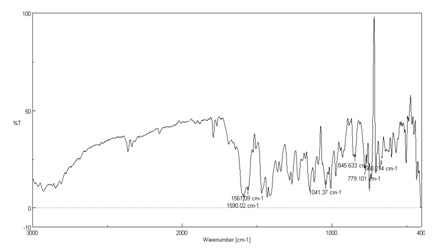 The obtained pellet disc was taken in a diffuse reflectance sampler, and the spectrum was recorded by scanning in the range of 400 to 4500 cm-1 in the FT-IR spectrophotometer (Perkin Elmer, RX1). DSC Studies: Olanzapine, HPβCD, and inclusion complex were accurately weighed (5 mg) in aluminum pans, sealed and subjected to DSC on Seiko Instruments Inc. SІІ DSC 6220. Thermograms were recorded by heating samples from 30 ºC - 300 ºC at a heating rate of 10 ºC/min under nitrogen flow with the empty aluminum pan as the reference. Preparation of MDFs: Olanzapine MDFs were prepared by the solvent casting method using pullulan as a film-forming agent. Olanzapine was dissolved in an aqueous solution of pullulan 14-17, followed by addition of PEG 400 as plasticizers. Aspartame and citric acid were incorporated as sweeteners in the solution mixture. The solution was poured on a Petri dish with a diameter 9 cm; films were cast and dried in hot air oven at 45 ºC. The films were removed from the Petri dish, checked for any visual deformities and cut into the desired size (2 × 2 cm2) to deliver an equivalent drug dose per film. Films with air bubbles, cuts or imperfections were excluded from the study. MDFs by Factorial Design: Optimization of MDFs was done by Design of Experiment (DoE). It is a systematic method used to determine the relationship between factors affecting the process and the output of that process. In the current research, we had adopted a 32 factorial approach with two independent variables, the concentration of polymer (X1) and concentration of plasticizer PEG 400 (X2) at three levels. The design layout and level of independent variables is as shown in Table 1 and Table 2 respectively. Effect of independent variables was investigated on percent drug release, tensile strength and disintegration time as responses. Where; Y is the measured response of each dependent variable, i.e. drug release (%), elongation (%) and tensile strength; B0 is the arithmetic mean response of nine runs; B1 and B2 are the coefficients of the variables X1 and X2 respectively; X1 and X2 (main effects) represent the average result of changing one variable at a time from its low to high value; X1X2 (interactions) is the response parameter change when two or more variables are changed simultaneously. Weight Variation Test: Olanzapine MDFs of dimensions 2 × 2 cm2 was cut from three different positions of a single cast film. Each film was weighed on an electronic balance, and weight variation was calculated. Measurements were performed in triplicate. Thickness: Thickness and uniformity of MDFs were determined by digital vernier caliper. Measurements were made in triplicate to calculate the mean thickness of MDFs. Folding Endurance: Folding endurance of MDFs is determined manually by wrapping a strip of film repeatedly at the same place until it breaks. The number of time the film is folded without breaking is computed as folding endurance value. Surface pH: The surface pH of MDFs was determined by slightly wetting the films with water and kept for 30-sec stabilization. The pH electrode was brought in contact with the surface of the formulation for surface pH measurement. The average of three determinations was done, and SD was calculated. Surface Morphology: Surface morphology of MDFs was studied using scanning electron microscopy (SEM) (Joel, Model - LV-5600 SEM, USA). The films were cut into small pieces and mounted on an aluminum stub with double-sided adhesive tapes, gold coated with a sputter coater and examined at an excitation voltage of 20 kV. Percentage Moisture Absorption (PMA): Percentage moisture absorption test determines the physical stability of MDFs at high humidity conditions. Three films of 1 cm2 dimension were accurately weighed and stored in desiccators containing a saturated solution of aluminum chloride, maintaining 79.50% humidity. The films were removed and weighed after 72 h and percentage moisture absorption was calculated. Percentage Moisture Loss (PML): Percentage moisture loss determines the integrity of films in a dry condition. Three films of 1 cm2 dimension were accurately weighed and stored in fused anhydrous calcium chloride desiccators. The films were removed and weighed after 72 h and percentage moisture loss was calculated. Uniformity of Drug Content: MDFs of dimensions 2 × 2 cm2 film were cut and added into a 100 mL amber volumetric flask. It was dissolved in 50 mL ethanol. The volume of the solution was made to 100 mL. From this solution, 1 mL was withdrawn and added into a 10 mL volumetric flask, and finally, volume was made to 10 mL with phosphate buffer pH 6.8. The solution was filtered, and absorbance was recorded at λmax 226 nm using UV-Spectrophotometry. In-vitro Disintegration Time: In-vitro disintegration time was determined using an alternative method by placing an MDF of 4cm2 in a glass Petri dish containing 10mL distilled water. The Petri dish was swirled at a 10 sec time interval. The time required for the MDF to disintegrate was recorded. Measurements were performed in triplicate. In-vitro Dissolution Study: In-vitro dissolution studies were performed in a USP dissolution apparatus Type-II (rotating paddle). Dissolution studies were performed with a 900 mL phosphate buffer (pH 6.8) maintained at 37 ± 0.5 °C with a speed of 50 rpm for 6 min. Accurately weighed MDFs equivalent to 5 mg of Olanzapine were introduced in the dissolution media. At predetermined time intervals, a 10 mL sample was withdrawn and replaced by fresh dissolution media maintained at the same temperature. Aliquots withdrawn were filtered and analyzed spectrophotometrically at λmax 226 nm. Stability Study: Optimized batches of MDFs were packed in aluminum foil and stored in a box to protect from light. Accelerated stability studies were performed at 40 ºC / 75% RH and 30 °C ± 2 °C / 65% RH ± 5% RH for 3 months. MDFs were evaluated for appearance, in-vitro disintegration time, surface pH and percent drug release. Physical Observation: Unchanged physical properties such as the absence of color change or caking in drug-excipients mixtures studied at different ratios when stored at various temperature conditions suggested suitability and compatibility of the MDFs formulation excipients with the drug. 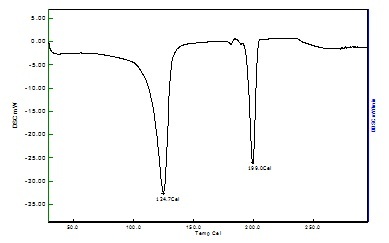 DSC Studies: A DSC thermograph of drug-HPβCD inclusion complex an exhibited an endothermic peak at 199 ºC while polymer and drug mixtures show an endothermic peak at 198.8 °C. DSC studies indicated weak interactions of drug and polymer. FTIR Spectra: FTIR spectra of the drug-HPβCD inclusion complex revealed that characteristics bands of drug were not altered and appeared in the spectra of drug-polymer mixtures at the same wave number. FTIR studies indicated no drug and polymer interactions. Solubility Enhancement of Olanzapine using HPβCD by Phase Solubility Studies: The solubility of Olanzapine increased linearly with an increased concentration of HPβCD (0-10mM) Fig. 2. The plot of concentration of drug versus HPβCD revealed a straight line with R2 of 0.9948 and a slope value (m = 0.0014) less than unity which indicated enhanced solubility of the drug due to formation of 1:1 inclusion complex. 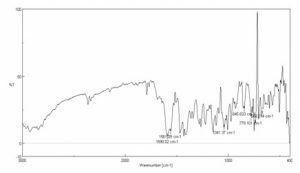 Stability constant (Ks) value was 515.463 M-1 and was within the range of 50-2000 M-1. Gibbs’ free energy is a thermodynamic function and change in Gibbs’ free energy (ΔG0) is the net energy available to do work and is a measure of “free energy” Table 3. In this study, the ΔG0 values were negative and increased with HPβCD concentration which indicated that the HPβCD solution offers a favorable environment for solubility of the drug. Characterization of Olanzapine- HPβCD Inclusion Complex: Drug Content: Drug content of Olanzapine-HPβCD inclusion complex prepared by the kneading method was 99% ± 0.5. Saturation Solubility: The saturation solubility of the drug was enhanced due to the formation of an inclusion complex with HPβCD. The solubility of Olanzapine was 12.5 μg/mL, and solubility of Olanzapine-HPβCD inclusion complex was 37.5 μg/mL. DSC Studies: The DSC thermogram of Olanzapine revealed sharp endothermic peaks at 104.7 ºC and 198.8 ºC, while HPβCD exhibited a typical broad endothermic peak at 103.1 ºC. The disappearance or shifting of endothermic or exothermic peaks of drugs is mostly an indication of the formation of an inclusion complex. The DSC thermogram of Olanzapine-HPβCD complex showed characteristic changes in melting endotherm and its enthalpy. Both the endothermic peaks were shifted to a lower temperature with reduced intensity and enthalpy. This could be due to the possible interaction between Olanzapine and HPβCD Fig. 3. 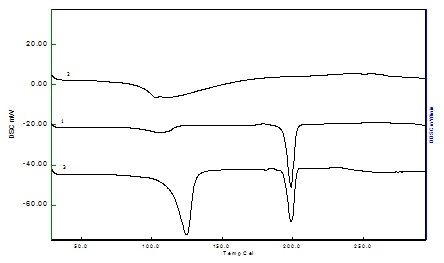 FTIR Studies: The FTIR of Olanzapine-HPβCD inclusion complex was characterized by 1041 cm-1 due to O-H bending, 1590.02 cm-1 (C=C), 1561.09 cm-1 (C=N stretching), 779.10 cm-1 (C-H bending), 845.63 cm-1 (N-H bending) and 668.21 cm-1 (S-C stretching). Reduction and extension of C=C characteristic bands (1450–1600 cm-1) confirm the hypothesis that complexation occurs between the aromatic ring within the hydrophobic cavity of HPβCD Fig. 4. Scanning Electron Microscopy: SEM image of Olanzapine - HPβCD inclusion complex is presented in Fig. 5. 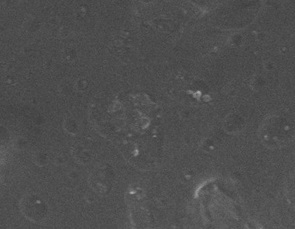 The Olanzapine - HPβCD inclusion complex observed was soft and thin with agglomerates of particles present within each other. Appearance: All mouth dissolve films were found to be of a transparent and smooth uniform surface. Weight Variation Test: The result showed that as the concentration of polymer increases the weight of the film also increases. Thickness: The thickness of mouth dissolving film depends on the concentration of polymer. Thickness of all mouth dissolving films was measured with a digital caliper. All the mouth dissolving formulations of different polymers showed a thickness value in the range of 0.09 ± 0.01 to 0.14 ± 0.011 mm. The result of the thickness measurement showed that as the concentration of polymer increases, the thickness of the mouth dissolving film also increases. Tensile Strength: We observed that an increase in the concentration of polymer reflects the changes in all other variables. Specifically, in the case of the polymer, we observed that as the concentration of polymers increase, the viscosity of the solvent system which was to be cast also increases. It affects the thickness and brittleness of the film. The result showed that as the concentration of polymer increases, the tensile strength of the mouth dissolving film also increases. The tensile strength of all F1 to F9 batches found to be in between 3.0 - 6.23 g/cm2. % Elongation: The result showed that as the concentration plasticizer increases tensile strength and % elongation of mouth dissolving film also increases. Folding Endurance: Folding endurance indicates the brittleness of the film. The result showed that as the concentration of polymer and plasticizer increases, the folding endurance of mouth dissolving film also increases. Folding endurance of all F1 to F9 batches found to be in between 163% - 70%. 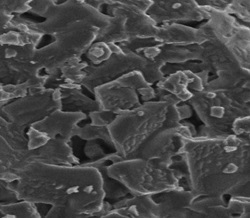 Surface Morphology Study: The scanning electron photomicrograph of films of F2 Fig. 6 showed a smooth surface without any scratches or transverse striations which indicates the even distribution of olanzapine and uniform film. Percentage Moisture Absorption (PMA): The PMA test was carried out to check the physical stability of the mouth dissolving film in high humid conditions. Three films were taken, weighed accurately and placed in desiccators containing a saturated solution of aluminum chloride, keeping the humidity inside the desiccators at 79.5%. After 72 h the films were removed, weighed and percentage moisture absorption was calculated by using the following formula. The PMA of all F1 to F9 batches was found to be in between 2.6-4.8%. Percentage Moisture Loss (PML): Percentage moisture loss was calculated to check the integrity of films in a dry condition. Three 1cm square films were cut out and weighed accurately and kept in desiccators containing fused anhydrous calcium chloride. After 72 h the films were removed and weighed. Percentage moisture loss was calculated by using the following formula. Percentage moisture loss was found between 1-3.3%. Uniformity of Drug Content: All the mouth dissolving films were found to contain an almost uniform quantity of the drug, as per content uniformity studies indicating reproducibility of the technique. The drug content in the films was evaluated, and the values were found to be 99% for three different cuts from each film. As per the USP requirements, the films were found to meet the criteria for content uniformity. No significant difference in the drug content among the films indicated good content uniformity. In-vitro Disintegration Time: In-vitro disintegrating time for a mouth dissolving film of Pullulan was ranged from12 sec to 22 sec. Olanzapine MDFs using 32 Factorial Design: Two factors varied at three levels in a 32 factorial design resulted in nine formulation combinations. Design expert software version 8.0.7.1 was used to perform a multiple linear regression analysis to determine the control factors that significantly affect the response. 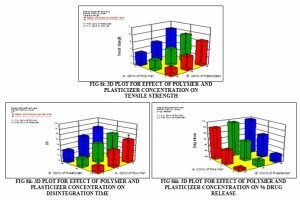 Polynomial Equation: The effect of the concentration of polymer (X1) and the concentration of plasticizer PEG 400 (X2) varied at three levels on predicted responses, percent drug release, tensile strength and disintegration time. The application of response surface methodology yielded the following regression equations, which suggest an empirical relationship between the values of responses and the independent variables in the coded unit. From the above polynomial equation (i) it is observed that with an increased concentration of polymer and plasticizer the tensile strength of MDFs increased; however, a higher plasticizer concentration yielded sticky MDFs Fig. 8i. Equation (ii) revealed that increased concentration of polymer increased the MDFs disintegration time which is attributed to the formation of thick films due to a high polymer concentration which needs more time to disintegrate Fig. 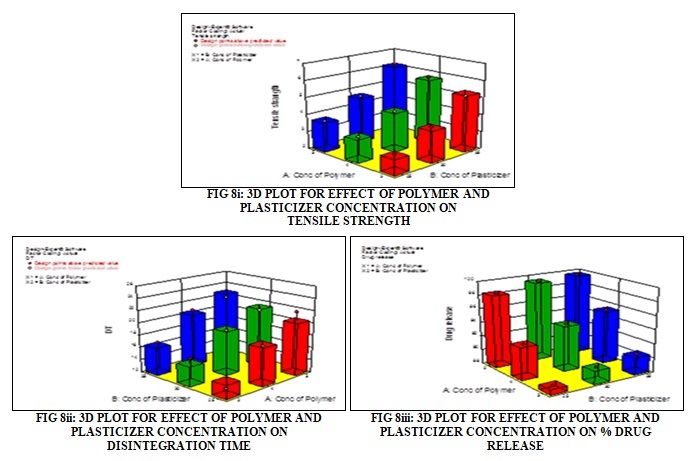 8ii, while equation (iii) revealed that a lower concentration of plasticizer and a higher concentration of polymer reduced the percent drug release Fig. 8iii. A high drug release was observed with a lower polymer concentration. Based on the above results of the percent drug release, disintegration time and tensile strength, the Olanzapine MDF batch F2 was optimized containing 30% w/w polymer concentration and 3% w/v Pullulan. Stability Study of Olanzapine MDFs: Stability studies of Olanzapine MDFs were performed as per ICH guidelines for 3 months. At 40 ºC ± 2 ºC / 75% ± 5% RH the MDFs were yellow in color and transparent in appearance with an in-vitro disintegration time of 16.75 ± 0.38 sec and surface pH of 6.54 ± 0.18. At 30 °C ± 2 °C/65% RH ± 5% RH the MDFs were yellow in color and transparent in appearance, the in-vitro disintegration time was 16.35 ± 0.24 sec with surface pH of 6.55 ± 0.36 Table 5. Stability results indicated that the MDF formulation F2 was stable on storage. In-vitro drug release of the MDF is as shown in Table 6. CONCLUSION: Olanzapine, a bitter drug with poor aqueous solubility was successfully formulated in MDFs. 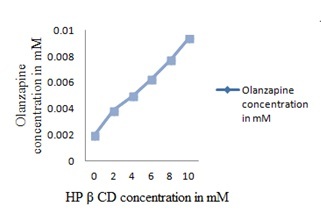 An inclusion complexation of Olanzapine with HPβCD at 1:1 molar ratio enhanced the drug’s solubility. The solvent casting method resulted in the development of MDFs with an acceptable tensile strength, percentage elongation, in-vitro disintegration, and in-vitro dissolution characteristics. Taste-masked Olanzapine MDFs showed a better appearance and were more acceptable to patients. 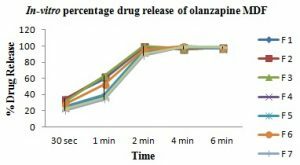 Rapid release of Olanzapine from MDFs indicated its suitability as an oral delivery system in the management of the panic attacks of depressive schizophrenia. ACKNOWLEDGEMENT: The authors are thankful to Hayashibara Company Limited, Japan for providing a gift sample of Pullulan. Bala R, Pawar P, Khanna S and Arora S: Orally dissolving strips: A new approach to oral drug delivery system. Int J Pharm Investig 2013; 3(2): 67-76. Patel AR, Prajapati DS and Raval JA: Fast dissolving films as a newer venture in fast dissolving dosage forms. Int J Drug Del Res 2010; 2(2): 232-246. Parkash V and Maan S: Fast disintegrating tablets: Opportunity in drug delivery system. J Adv Pharm Technol Res 2011; 2(4): 223-235. Mahesh A, Shastri N and Sadanandam M: Development of taste masked fast disintegrating films of levocetirizine dihydrochloride for oral use. Cur. Drug Deliv 2010; 7(1): 21-27. Kulkarni AS: Formulation and in-vitro evaluation of orally disintegrating tablets of an olanzapine-2-hydroxypropyl-β-cyclodextrin inclusion complex. Iranian J of Pharm. Res 2010; 9(4): 335-347. Higuchi T and Connors KA: Advances in Analytical Chemistry Instrumentation. Wiley-Interscience 1965; 117-212. Sherje A and Londhe V: Inclusion complexes of hydroxypropyl-β-cyclodextrin and paliperidone: preparation and characterization. Curr Drug Discov Technol 2014; 11(4): 271-278. Joseph E and Balwani G: Validated UV Spectro-photometric methods for the estimation of olanzapine in bulk, pharmaceutical. 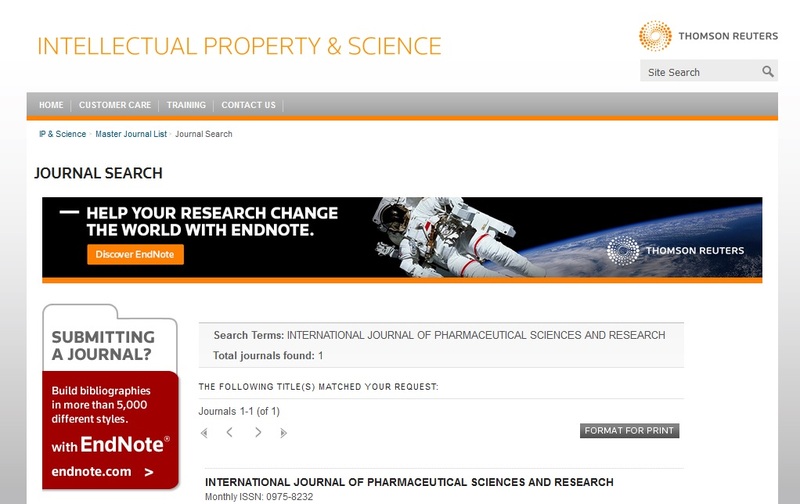 British Journal of Pharmaceutical Research 2015; 6(3): 181-190. Panchal MS: Formulation and evaluation of mouth dissolving film of ropinirole hydrochloride by using pullulan polymers. 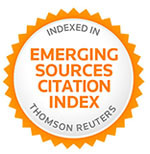 Int Journal of Pharm Res & Allied Sci 2012; 1(3): 60-72. Pethe A and Desai R: Formulation, optimization & evaluation of mouth dissolving film of nifedipine by using the design of an experiment. Asian Journal of Pharmaceutical Sciences 2016; 2: 74-76. Bhusnure OG: Formulation and evaluation of oral fast dissolving film of gabapentin by QBD approach. IJPBS 2018; 8(2): 426-437. Vuddanda PR: Effect of plasticizers on the physicomechanical properties of pullulan based pharmaceutical oral films. European Journal of Pharmaceutical Sciences 2017; 96: 290-298. Momin M, Lalka S, Mhatre S and Mistry S: Formulation development and in-vitro characterization of fast dissolving polymeric films of olanzapine for the management of panic attack of schizophrenia. Int J Pharm Sci & Res 2019; 10(4): 1765-74. doi: 10.13040/IJPSR.0975-8232.10(4).1765-74.